The economy of any MMO can be tricky to learn and extremely tough to master. This is especially true of a new game like WildStar that doesn’t have an abundance of resources to learn from yet. With new names for currency (plat anyone? ), various points of sale (CX, AH, vendors, etc. ), and so many different types of currency (gold, renown, prestige, elder gems, crafting vouchers, CREDD), it’s easy to see where things might get confusing. On my server, the prices on the commodities exchange (CX) haven’t quite normalized, and many people are selling items for less than the vendor sale price. For this reason, I sell a ton of stuff to the vendor. Wouldn’t it be great if you could get even more gold for your vendored items? You can! If you are a settler, you can activate a settler buff in your capital city that will let everyone in the city sell items to vendors for 5% more and buy items from vendors for 5% less. It is called Thayd Vendor Discounts (Illium for Domnion) and applies the buff “Small Vendor Price Discount” to vendors. In Thayd, the settler resource depot can be find to the west of Fortune’s Ground. You can easily tell if this vendor buff is active because the affected vendors have an explosion of gold coins over their heads. The vendor buff on my favorite vendor, Far-Trader Sawa. So if you are a settler, try to activate this buff whenever you can. If you aren’t a settler, it’s okay, we can’t all be perfect. 😉 Just find a friend who has chosen this master path or ask in zone chat for a friendly settler to assist. Hi, my name is Trin, and I’m an altoholic. 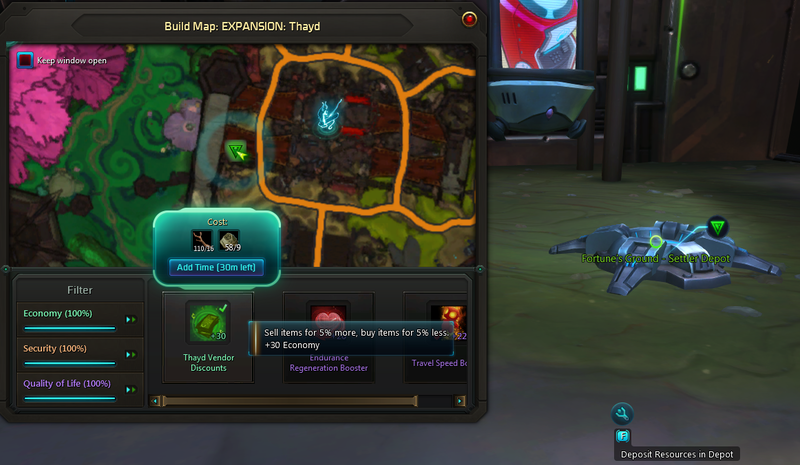 During WildStar’s first weeks of release, players spent hours on Nexus enjoying the game in a variety of ways. Many players hit the level cap of 50 and moved on to prep for raid attunement. Others got to 14 and have been decorating their new housing plot. Some players are taking their time to enjoy every nook and cranny of WildStar, smelling all of the virtual roses on Nexus during their leveling path. Me, I’m raising a small army of alts. I was planning to level my main toon to 50 during the first week and then make some alts after that. I actually only made it to level 15 before my first alt was created. The reason for the birth of this alt was quite simple – gold. I wanted to buy a mount, expand my housing plot, work on tradeskills, and purchase a few cool reputation items from the vendors. But I was broke! I had enough gold to buy a mount for 10g, but then I would only have a few copper left to my name. My esper is pretty close with this lady! My main had two gathering tradeskills. which I thought would be a great source of early gold. So I had bags full of items to sell on the auction house or commodities exchange, but I didn’t have time to list auctions and level. So I made my plucky Aurin Esper, leveled her up to 14, and took her to Thayd. I mailed her all of my ore and wood that I’d gathered on my main. This was quite painful because mailing items costs precious silver! As I checked out the prices on the commodities exchange, I was quite disappointed that the market on my server had been flooded with ore and wood. These items weren’t selling for much at all. So I quickly changed directions and selected the architect tradeskill for this alt. I thought that I could probably make some fun items for my house that might even sell. I spent the small amount of gold that I had to level up my architect, switching back and forth between farming on my main and crafting on my alt. She finally raised her skill level high enough to craft her first FABkits. I made quite a few of these, thinking that I would need them for all of my housing plots. Then I checked the auction house to see if I could sell the rest. I was amazed to find that the Tier 2 gathering kits were selling for more than 10 gold each. This was a small fortune to me at the time! 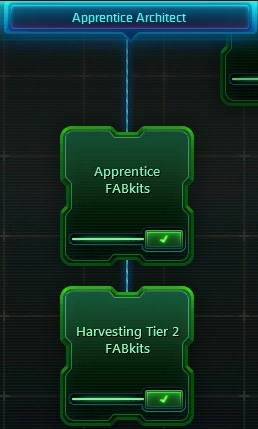 It became my mission to craft and sell FABkits until the market collapsed. At one point, it was difficult to keep up with the demand. I leveled my main solely to gather mats for my architect. Within the first week, I earned my first platinum. My main was only level 23! Now that I’m level 50, I realize that 1 plat isn’t really a lot. But at level 23, it was amazing! Gold in video games gives you freedom, in my opinion. I’m a bit of a cheapskate, even in virtual worlds, so having a nest egg is very important to me. I could buy a mount, play around with housing items, and generally not worry about spending a few silver here and there. I already have two more alts. The first is a level 10 engineer created to level the technologist tradeskill. The other is a level 14 engineer that I made on the RP server Evindra to browse through public houses (that server has some amazingly creative players!). It’s a good feeling to know that I can give them each some gold to use on tradeskills, houses, and repairs . . . thanks to the hard work of their purple-eared esper sister!